Since forming a digital wallet partnership with Google last April, online payment facilitator PayPal made one of the biggest leaps in brand health metrics among the 1,600 brands tracked daily by YouGov BrandIndex. The partnership lets PayPal users link their accounts to Google’s Android Pay, available on almost all current Android smartphones. 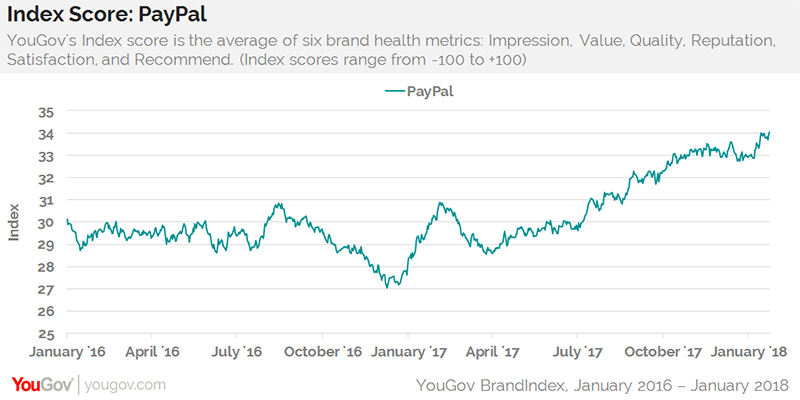 Over the past eight months, PayPal achieved the 15th largest gain in Index score of all tracked brands, YouGov BrandIndex’s flagship metric of brand health. Index is an average of six key scores: Impression, Value, Satisfaction, Reputation, Quality, and Willingness to Recommend. Android captured 85% of worldwide smartphone volume as of the first quarter 2017, according to IDC, underscoring the impact of PayPal’s pact with Google.